My mother gave me a book recently and said that there was some information for me in it, about coeliac disease. It is about natural healing and naturopathy and she said that I might it useful. Mention is made of a diet of gluten free cereals and a ‘brown rice gruel or porridge to which has been added raw carrot juice’ and that white flour products are on the taboo list. The book was first published in 1952 so maybe I can overlook most of what the writer says. But I got to thinking about exactly when Coeliac Disease was first discussed and identified which lead me from one google search to another. 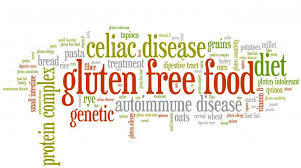 An interesting and comprehensive article by Dr Guandalini from University of Chicago Celiac Centre gives the history. All I can say is that remarkable progress has been made in the twentieth and twenty first centuries and that knowing that you are a coeliac disease sufferer is much more empowering and healthier than not knowing and being seen as a malingerer.